“Mr. President, I rise today to give my second speech this week discussing the issues we are facing following last week’s tragedies in Dallas, Minnesota, and Baton Rouge. This speech is perhaps the most difficult because it’s the most personal,” said Sen. Tim Scott, R-SC, in the Senate Chamber last week. Scott has a long, distinguished record of public service, serving 13 years on the Charleston County Council beginning in 1995. 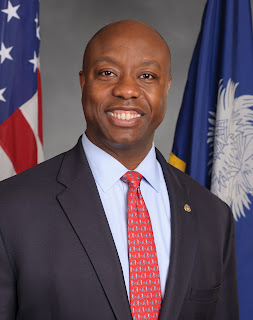 In 2008 he was elected to the South Carolina House of Representatives, in 2010 he elected to the U.S. House of Representatives, and was appointed to fill an unexpired U.S. Senate term in 2012 and was elected to retain that seat in 2014. 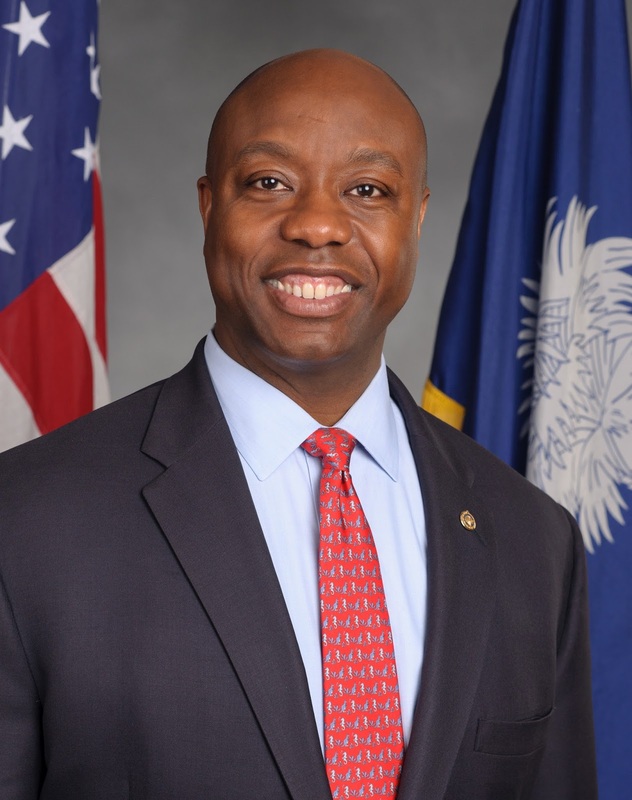 He is the first southern African-American senator since the late 1800s. That was not the last time he was stopped by police, he said; he has been stopped seven times in the period of a year, and admitted that he was speeding a couple of times, but usually he was stopped for things like driving a new car in the wrong neighborhood, or some other equally trivial reason. “Imagine the frustration, the irritation, the sense of a loss of dignity” each of those times, he said, capping the story off with an incident that happened while he was serving in the U.S. Congress. 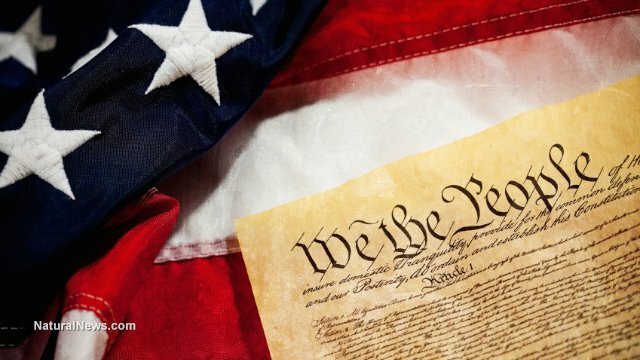 After having been in Congress for five years, and at the time in the Senate, an officer challenged him as he entered a government office building. 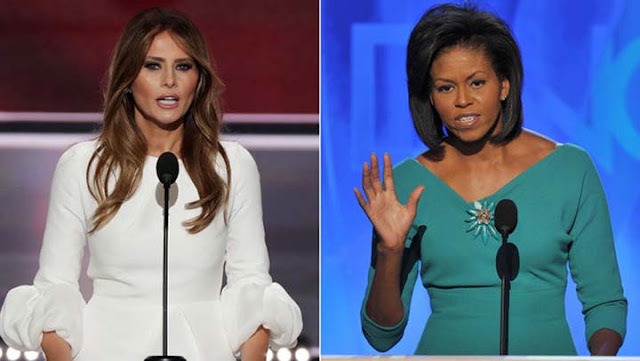 “The pin, I know,” the officer said, referring to Scott’s U.S. Senate lapel pin. “You, I don’t. Show me your ID.” Later that day he received an apology from the officer’s supervisor, but the damage was done. Again. That was the third such apology he had received since entering the Senate. Police question millions of Americans of all races every year in their effort to “protect and to serve,” and they should always have a legitimate reason for doing so. Obviously, they don’t always have a good reason, as Sen. Scott illustrated. But often they do have reasons, and sometimes it is at least partly due to the behavior of some of those in groups that are often the focus of police bias. Chicago serves as a prime example, a place where black Americans are most often killed or attacked by other black Americans, not white Americans or police officers. In neighborhoods where back people routinely commit violence and murder against other blacks, why are we surprised that blacks receive greater police scrutiny? Columnist Peggy Noonan recently wrote a column titled “Three Good Men Talk About Race” in The Wall Street Journal, all of them black Americans. They are Tim Scott, Dr. Brian Williams of Parkland Memorial Hospital, who fought to save injured Dallas police officers ambushed by a black man, and Dallas Police Chief David Brown. “We’re asking cops to do too much in this country,” Brown said recently. “They’re paying the price for every societal failure. “Not enough mental health funding? ‘Let the cop handle it.’ Not enough drug addiction funding? ‘Let’s give it to the cops,’” he continued. The chief said that society must get in the game. In response to blacks being killed by police we now see black men assassinating police officers. The shooter in Dallas who killed five officers and injured seven others was black. In Baton Rouge, six officers were ambushed last Sunday, and three of them died. Police killed the shooter, a 29 year-old black man who, according to The Daily Caller, was a former member of the Nation of Islam. As Scott said, the country is deeply divided; there is a very tense trust gap. Police sometimes unfairly target black people. Many black people assume every death at the hands of police is a wrongful death. We need leaders to calm the tension, not pour gasoline on emotional embers, to wait for details before reaching a conclusion. And we must make sure that all who do wrong are punished. It is natural for politicians to put things in the most favorable light, and the worse the general situation, the greater the need to do so. That serves as an appropriate introduction to the White House’s June economic analysis, which is summarized thusly: “The economy added 287,000 jobs in June, as labor force participation rose and the broadest measure of labor market slack fell.” As far as that statement goes, it is true. That new jobs number is a decent number – the best jobs figure since October – and miles ahead of May’s revised number of only 11,000 new jobs. But it is not an outstanding number, and is only one of several really significant numbers. Back in December 2009, six months after the end of the recession and 11 months into Barack Obama’s first term, economist Paul Krugman said that 300,000 new jobs each month were necessary to make up the job losses of the recession over the next five years, so the June figure falls short of that number. In the weak Obama recovery new job production has only met or exceeded 300,000 six times in 89 months. The last was in November of 2014 at 331,000. Whether the 287,000 number holds up after revision we won’t know until August. May’s preliminary number was revised down by more than two-thirds to a mere 11,000; therefore August may show a downward revision, an upward revision, or a number that is pretty close to the preliminary figure. Other relevant numbers from the Bureau of Labor Statistics (BLS) data set for June include an increase in the U-3 unemployment rate, the one President Obama prefers to cite, from 4.7 to 4.9 percent. Despite the increase, the U-3 rate still looks good because it discounts all those marginally attached to the labor force that involuntarily work part-time instead of full-time, or have given up looking for work because they cannot find a job. Those workers are included in the U-6 rate, which more accurately represents reality, and stood at 9.6 percent in June, and improved one-tenth of a percent since May, as some of the previously disaffected workers started seeking employment again. Even so, the Labor Force Participation rate was still at the late-70s level of 62.7 percent. From 66.0 percent in December of 2007 when the recession began, the trend in the participation rate has been steadily downward and has been below 63 percent since March of 2014. The labor force is made up of those age 16 and older that are working, looking for a job, and not in prison or in the military, and totaled 94,517,000 people last month. That means that 56,228,000 working age Americans are not working, and not in the military or in prison. In June, 1.8 million persons were marginally attached to the labor force. These are individuals who wanted to work, were available for work, and had looked for a job sometime in the prior 12 months, but were not counted as unemployed because they had not searched for work in the 4 weeks preceding the survey. Another 5.8 million individuals prefer full-time employment, but are working part time because their hours had been cut back or because they haven’t been able to find a full-time job. The 9.6 percent U-6 rate tells one part of the story, but the actual harm of the administration’s policies that keep the economy from cranking up are another story. 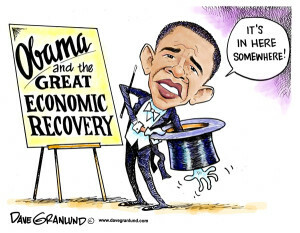 Today, with a real unemployment close to 10 percent, Obama may be viewed as a pretty good prophet. However, rather than seeing the future, he engineered it, and the term “new normal” is much less a reality than an excuse. As the JCN’s Ortiz noted, high taxes, rampant and intrusive regulation and limited credit do not a good recovery make. America deserves better. November’s election provides the opportunity to elect as president someone who understands job creation.